If you have a bug report to make, use your discretion as to whether it warrants a new topic, or just post it here. If it's a visual bug, take a screenshot! Make sure you can repeat whatever happened and describe the problem as thoroughly as you can. Change the topic or post number per page. It's maybe not really a bug but as an IT guy I can't help but notice the login forms and email confirmation url of the forums are not secured through SSL/https, so it probably is a security risk for all people not using their Google or Twitter account to log in. It is probably possible to get people's username/email address and password because of this. I wasn't really looking for problems with this site and I really like how everything looks and works, but for the last 8 years or so my webmaster colleague has asked me quite a few times to help her debug/test her websites, so I see stuff like this without looking for it unfortunately. I can't vote up a post in mobile mode. Edit: On Safari, iPhone 6 Plus if it helps. Didn't try in another browser. The login option in the menu still shows even after I have logged in, might be nice to replace it with a link to the profile? Also, the Search button shows twice. This just started popping up on the main site in the latest version of Chrome. EDIT: Blood fixed it, it's all good. 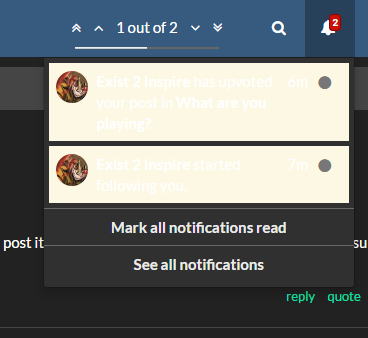 @Oscillator You don't get notified about downvotes I don't believe. I'll downvote your post and you can confirm and I'll undo it. Yeah, that's what I thought. Probably stops fights if downvotes are hidden. Removed the downvote so it's not a -1 post anyway! It would be nice to know though if somebody actually didn't like my post or the upvote was a mistake and the same person just undid it. @Kneefoil I'll see if that's a plugin I need to install. Weird that half the functionality would be built-in and the rest in a plugin. Creating links in posts are adding an easyallies.com forum wrapper around the URL itself, leading to pages that don't exist. Uhh, sorry that this isn't really a bug, but I didn't think it warranted a new thread in the least, so here goes. The description for the "Shows" forum lacks an "s" near the end: "Discuss all the latest episodes of EZA show!" When the browser is not fullscreen (half-screened here), the banner hides the top of the New Topic button.